Smart Online Examination will reduce the huge work done by teachers, administrators and also students. Response of the candidates will be checked automatically and instantly. Reduce paper work. Result will be shown immediately that will reduce student anxiety. Can be used anywhere anytime as it is a web based application. Useful for teachers for managing exams. It can be conduct any time. 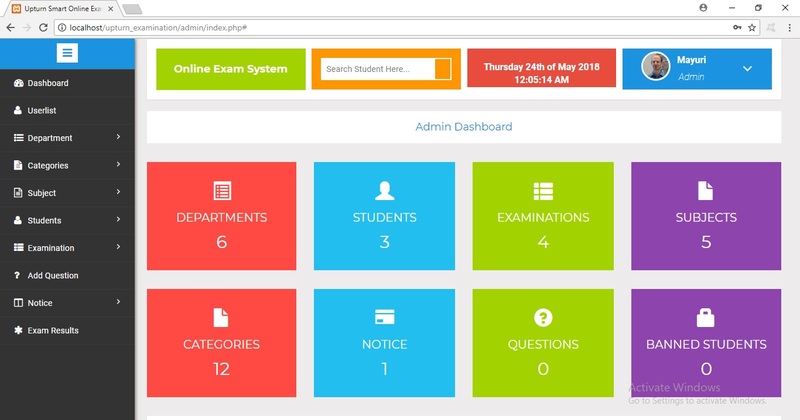 The Upturn Smart Online Examination System is a web based application. The system suits the need of Educational Institutions, Primary and Secondary Schools, Colleges, Universities and Training Academies. The system aims at reducing costs associated with conducting exams and achieving total automation of examination system-related tasks like registration, publication of results, which leads to a very high degree of system efficiency. Username and password of admin..